In her first book, squash champion Toorpakai recounts her remarkable life as a tomboy athlete in tribal Pakistan. There are many stories about women who overcame sexist hometowns to become sports legends, but Toorpakai’s case was extreme: she grew up in Waziristan, an extremely traditional region where women are routinely stoned to death for transgressions. Yet the exhilarating first chapter shows the author defiantly burning her dresses and slashing off her long hair. Toorpakai was a born athlete, and her skills as a squash player helped her escape. But her game of choice is less important to her tale than the brutality of her homeland. Before she ever picked up a racket, the author witnessed a savage execution and several coldblooded homicides. She received a beating from a mullah and was called a “dirty girl” because she liked soccer. Toorpakai might have met a tragic fate, but her father was shockingly progressive: a gentle and good-humored professor, he encouraged his daughter to identify as a boy. “Life as a boy was beautiful,” she writes, “without silk ribbons or beaded dresses or long, black braids. It was a bold and rugged beauty….It was sweat-soaked T-shirts and my brother’s cast-off shorts.” But as Toorpakai succeeded on the court, she roused dangerous enemies. 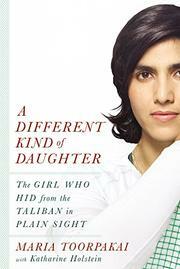 Threatened by Taliban killers, she was rescued by Canadian squash champion Jonathan Power. Unlike so many sports memoirs, Toorpakai and co-author Holstein write eloquently about Pashtun life, and the prose is often poetic and even mystical. For the author, becoming a pro athlete has been a matter of life and death. “It’s not about playing anymore, Maria,” her father said just before her first tournament. “It’s about staying alive.” The book ends abruptly with her arrival in Canada, but it seems clear that Toorpakai’s real life is just beginning. A vivid personal account of a courageous young woman standing up to one of the world’s most oppressive theocracies.